Funeral arrangements for Army Spc. Sergio Gudino will take place this week. POMONA -- Funeral arrangements for Army Spc. Sergio Gudino will take place this week. Gudino, 21, of Pomona died Christmas Day after a bomb exploded near the tank he was driving during combat operations in Baghdad, Iraq, according to the U.S. Department of Defense. 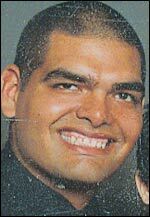 Gudino was the third Pomona man to die in Iraq in 2005. He was assigned to the 1st Battalion, 64th Armor Regiment, 2nd Brigade Combat Team, 3rd Infantry Division out of Fort Stewart, Ga.
Visitation will be from 10 a.m. to 9 p.m. Friday at Forest Lawn -- Glendale, 1712 S. Glendale Ave. The funeral service is scheduled for 2 p.m. Saturday at the Church of the Recessional, Forest Lawn -- Glendale.